I purchased Delta The Journal when I visited Italy earlier this year. I got a Visconti Van Gogh Starry Night as well as a Lamy Al-Star Limited Edition Copper Orange at the same time. I bought Delta The Journal from Casa delta Stilografica in Florence, Italy. It is a treasure trove of fountain pens of various brands. They had recommended Delta The Journal when I asked for an entry level Italian fountain pen. 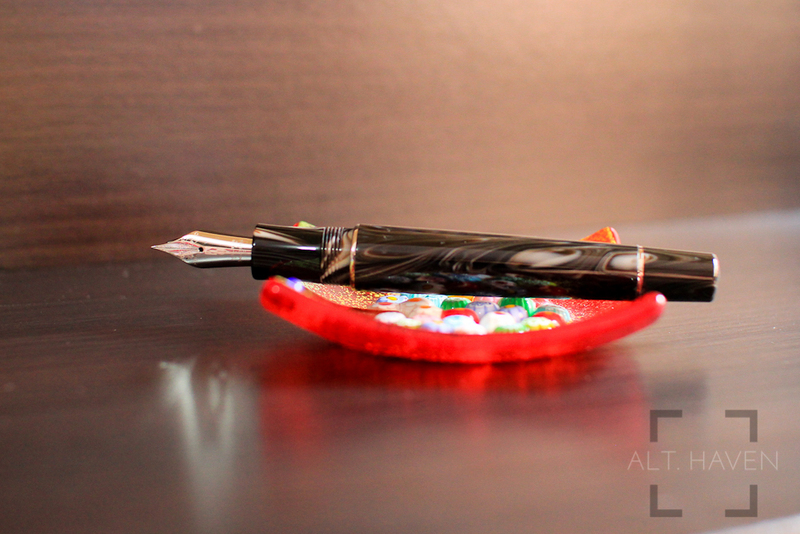 Fountain pens of the Journal collection are turned from bars of Italian resin. It was designed to honour journalists and freedom of speech. Delta The Journal pens are numbered but they are not a limited edition pen. If you must know, my pen is numbered 3931. Delta The Journal comes with a bottle of Delta black ink in a rectangular box that’s covered with a cardboard sleeve and box. The cardboard sleeve spots a simple design of texts over lapping each other. Once the sleeve is removed, an additional black cardboard box is underneath. Once that’s removed a black box is revealed. Inside, the pen and bottle of ink is nestled among some satin like fabric. The Delta logo and tag line is embossed on the inside of the box. The box can be a little big and it is not as cleverly designed as some Lamy boxes but it does fulfil its purpose of protecting the pen and ink. My Delta The Journal fountain pen is supposed to be the brown one from among the various colour variations but it really looks more black and white than black, white and brown to me. The brown in the swirls on the pen is really quite subtle. It reminds me of a mix of chocolate and milk. The resin is really polished and smooth to the touch. 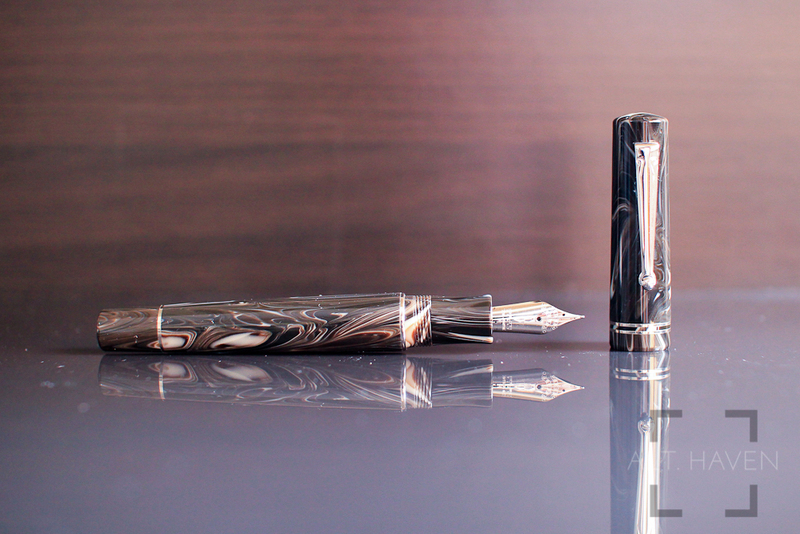 Plus the rhodium trim matched the look of the pen well. The design can look a little dated but the way a pen looks is merely skin deep and I am interested more than just the way it looks. The pen has a slightly domed top and end. It starts out wider at the top and tapers slightly down to a smaller circumference at the end. The clip is relatively flexible and has a small little roller at the end to aid in slipping the clip over a notebook or a pocket. At the back of the cap, the words “Delta Italy” are engraved on the top while the words “The Journal 3931” are engraved at the bottom. The cap has two rhodium rings just below the engravings. It unscrews easily with just one rotation and can be posted easily just by pushing it into the end of the barrel. The grip section and the barrel is made of the same resin material as the cap. The grip section is relatively wide when compared to my other pens. It flares out slightly towards the end near the nib. Though the grip is wider than I am used to I found it very comfortable to hold. The threads are smooth and they do not irritate my hand when I write. Delta The Journal takes standard international cartridges and converters but it comes with a screw in converter by Delta. This is my first time using a screw in converter. I found that it gives me a peace of mind knowing that the converter is securely engaged in the barrel. This is a nice touch by Delta. However the converter has a metal piston knob adds a little back weight to the entire balance of the fountain pen. The barrel also has a blind cap at the end of the pen. By unscrewing the blind cap, I can use the pen as if it is a piston filler instead of a cartridge converter pen. I am not sure why Delta felt this was necessary. I personally thought it was an odd choice of design. Delta The Journal is a good pen and it doesn’t have to pretend to be something it is not. Delta The Journal comes in a harmonic steel nib but the Fusion nib, 18k gold nib options are available too. 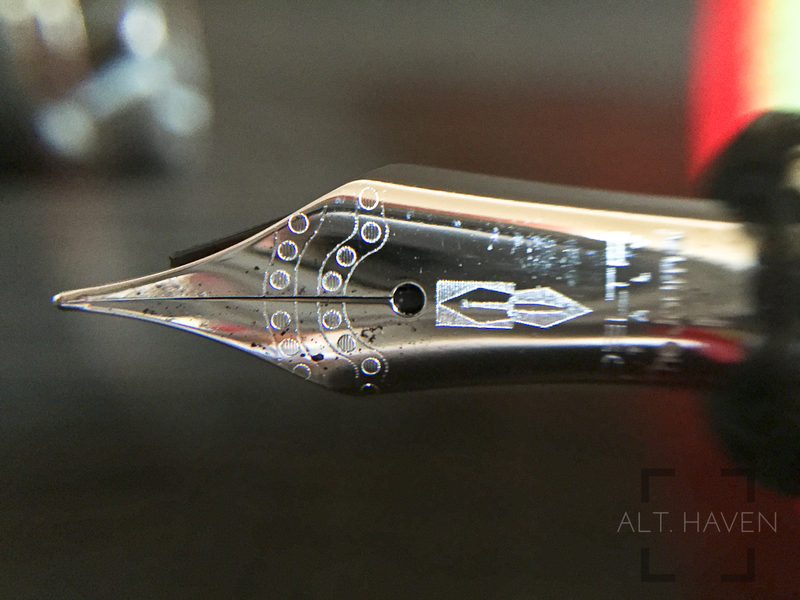 How does a harmonic steel nib differ from a regular stainless steel one? I have no idea since it looks and works very much like a stainless steel nib. 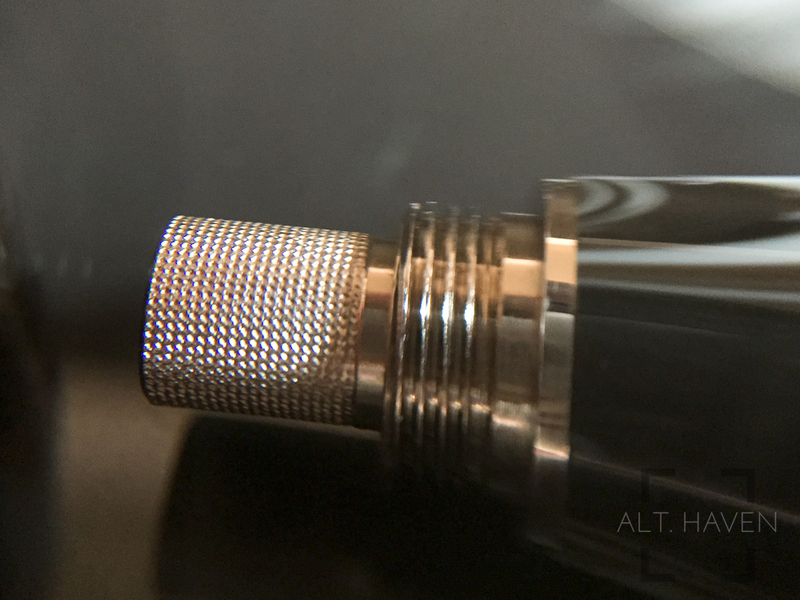 Check out this thread on the Fountain Pen Network if you want to read about some speculations. 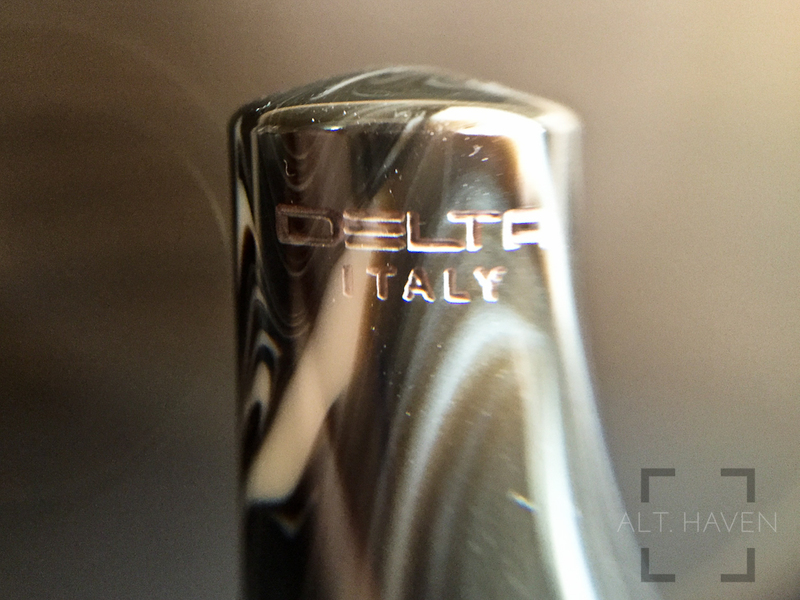 The nibs has the Delta logo along etched on it. It is also decorated with stylised image found on Pompeii archaeological artifacts. It is fitting since Delta is an Italian brand after all. The nib writes smooth and wet. It wasn’t so smooth like I was writing on glass but it was close. The nib isn’t hard like a nail but I couldn’t get any line variation out of it even when I pushed it. One special note, I had initially filled it with Mont Blanc Toffee Brown in the lead up to write this review. However it really, really doesn’t like that particular ink. It was writing very dry and was skipping horribly. I had to clean the ink out and tried it with Pilot Iroshizuku Yama Guri. It didn’t have any problems with Sailor Kobe Kaigen Grey which was the first ink I filled it with. Delta The Journal is an enjoyable pen to write with. 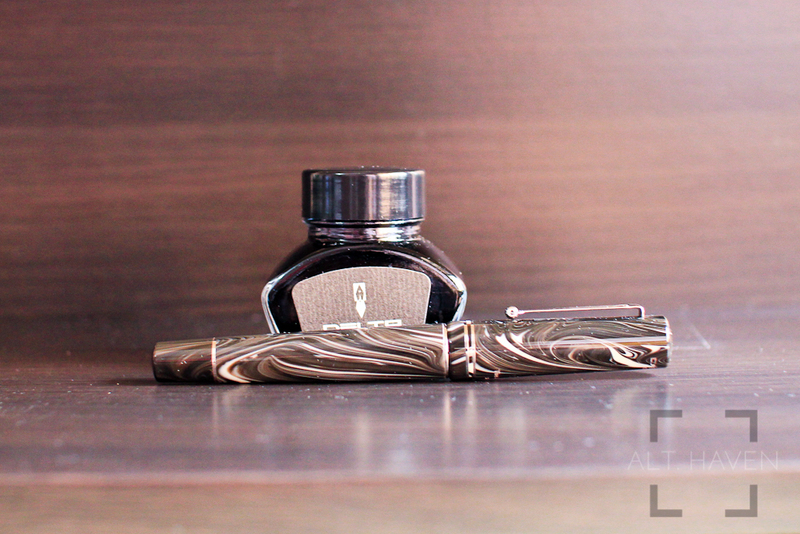 It is a fitting first foray into the world of Italian fountain pens. Though I must say the pen is slightly pricey, since it is a plastic (ok, resin) pen with a steel (fine, Harmonic steel) nib at heart. However, it performs well. If you are looking for an entry level Italian fountain pen, you wouldn’t go amiss taking a good look at Delta The Journal.